Extended Service Agreement Program is Changing! Extended service agreements for Tempstar® products are now offered through the Comfort Promise™ program, which is fully backed and administered by AIG Warranty. The program will be available in both the U.S. and Canada. Offering service contracts is a great way to give customers the peace of mind that repairs to their HVAC unit will be covered and that downtime will be minimal. With the new Comfort Promise program, the administrative efforts are minimal, and the results can help your business add to your bottom line. Dealers are reimbursed on a flat rate schedule based on repair codes. You’ll know before you ever get to the job what you’ll be paid for a covered repair. You’ll know how much you’ll be paid for repairs throughout the life of the program. There’s no uncertainty. You can choose a plan that makes the most sense for the homeowner as well as your revenue requirements for performing repair services. You’ll be able to choose from four different labor reimbursement rates. 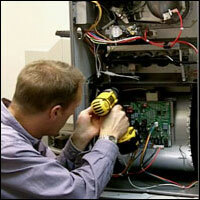 AIG Warranty is providing both the underwriting and administration of the program. The company is one of the industry’s premier service contract administrators, currently servicing over 80 million active contracts throughout the United States. For a nominal fee, the program allows the current homeowner to pass the service contract on to a new owner. For more information about the fee, contact AIG's dealer support representatives. It’s easy to file claims and manage contracts online. The program will be integrated into the current Service Bench warranty claiming process to simplify your experience. Just fill out the standard parts warranty with the current system and follow the link to the AIG site to easily complete filings. There is no change in handling claims on existing Assurant Solutions service agreements. ESAs sold prior to the change to AIG will continue to be administered and adjudicated by Assurant. Before you begin selling the new ESAs, you must enroll in the Comfort Promise program. Questions regarding new coverage and pricing should be directed to AIG. Additional information regarding AIG Warranty is available at www.aig.com. NOTE: Comfort Promise ESAs will be sold, administered and adjudicated solely by AIG. Contracts sold under the program are fully insured by AIG, its subsidiaries or affiliates, which carry an “A” rating with A.M. Best. Comfort Promise™ is a trademark of Akita, Inc.